Does Georgia Have A Venture Funding Shortage? Prior to joining ATDC, I didn’t think Georgia suffered from a lack of investment dollars as much as a shortage of quality startups to fund. Since joining ATDC, my views have changed somewhat. I decided to dig into the data and see if the facts supported that change. I looked at seed and early stage company funding data from the PriceWaterhouseCoopers MoneyTree Report from years 2005 to 2011 (through Q3) to compare Georgia to other tech hot spots. I excluded Silicon Valley from this comparison. We already know the answer – it is not a realistic comparison, and is unique for a host of reasons. Instead, I focused the analysis on more direct comparisons with North Carolina (Research Triangle Park) and Texas (Austin). I also included larger hubs New York and Boston. I compared Startup / Seed stage and Early stage investments by amount and number of deals. Before diving into the results, it’s important to note that while this is the best source of data I know of, the report doesn’t capture every deal and doesn’t capture most angel funding. It seemed to include 2 of the 3 local venture firms I specifically looked up. Therefore, the numbers are clearly inaccurate. However, the same issue exists for all regions so I’ll use this as ‘directionally correct’ rather than exact. 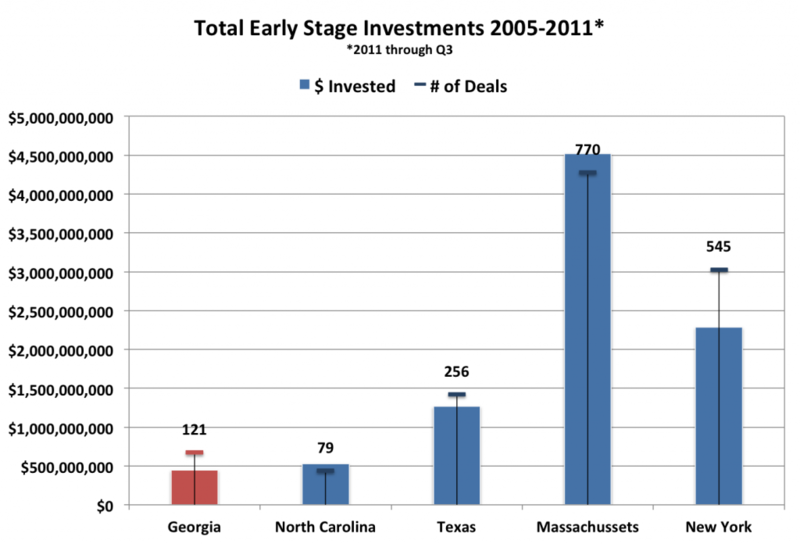 During the nearly 7 year period I looked at, the four comparison states had between 20% and 900% more invested in early stage companies than here in Georgia, and up to 6 times as many deals. But the root of the problem becomes evident when you look at the seed stage investments. During that same period, the comparison states had a whopping 380% to 4000% more total dollars invested in seed stage companies and between 2 and 15 times the number of deals! Not only is it harder for seed stage companies to get funded in Georgia, those that do receive less than in the other states. 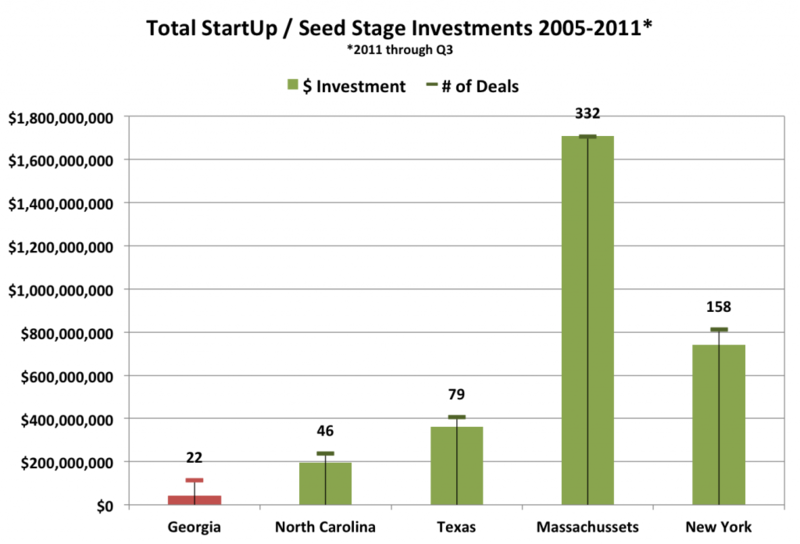 The average seed stage deal size in the comparison states was 1.5 to 2.3 times the size of deals in Georgia. The average deal size in early stage companies was 1.1 to 1.9 times the size of deals in Georgia. The significant gap at the seed stage also leads to a shortage of quality opportunities in later stages. In order to have more early stage, expansion stage, and later stage success to attract additional investment, we have to address the ‘top of the funnel’ first – the seed stage companies. There’s no reason Georgia shouldn’t be on par with other tech hubs – and we should certainly be competitive with Research Triangle Park and Austin. Georgia arguably has a greater abundance of many of the key ingredients. We have a track record of successful tech startups and a growing talent pool of entrepreneurs. Three leading research universities – Georgia Tech, UGA, and Emory – are within easy driving distance of each other. We have EII, GRA, and VentureLabs to help commercialize technology from those universities. Technology Square has become a hub for entrepreneurial activity and home to ATDC, an incubator Forbes named one of the top 10 in the world and Flashpoint. There is a base of local angel investors and venture funds. TAG, StartUp Lounge, StartUp Chicks, and numerous other organizations support the entrepreneurial community. Georgia is home to Fortune 1000 firms and regional headquarters. And we’ve already established leadership positions in transaction processing, security, and healthcare IT. So – what can we do to close the funding gap – especially the seed stage funding gap – in Georgia? Note: Click here to see more detail on the data, including breakdowns by year. I stumbled across your blog while searching Google images related to start-up funding ecosystems. Didn’t realize you did this analysis. Nice work, and thank you for putting it out there! Would love to do lunch so we can discuss how things have changed or not in your opinion since last November. Would love to help update the charts, and see if we can’t get some better data for angel deals in the region as well. Thanks for the feedback Nat. I know you guys at ATA have been more active. Let me know when you’ll be down at ATDC and we’ll grab that lunch.